“At first I was making a 1minute 1spot edit but i forgot how much i missed skating that i just kept rollin. This is how i welcome the warm weather! I didnt get to finish this edit because i got injured in the middle. I will be posting a montage soon. keep a look out” – John Staten. 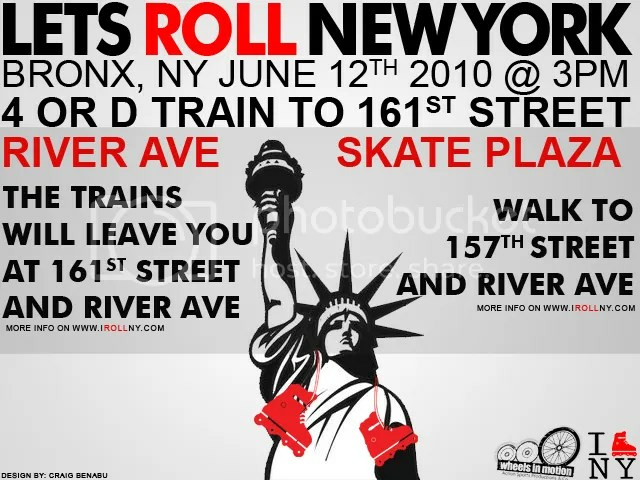 Lets Roll NY Session 9 took place at the River Avenue Skatepark in the Bronx, NY on June 12, 2010. A lot of skaters from all over NYC came out to session the new skatepark and the ledges by the newly built Yankee stadium. Skaters include (in order of appearance) Chauncey Jenkins, John Stephens, Erick Rodriguez, Malik Ashby, Evan Grimball, Jose Henriquez, Hector Rodriguez, Eric Estrada, Ryan Many, Shardy Nieves, Edgar Sanchez, Quang Trinh, and John Estrella. Daymian Ruiz is from the Bronx, NY and is just eight years-old. Daymian has been skating since he was 2 and just started aggressive skating about 5 months ago. Check out how the young generation gets down and peep his illusion 180 and pornstar 360 out in the edit up top. Filmed and edited by Harison Hadzovic. Stanley “Rufio” Hernandez put together an edit featuring some extra clips from an upcoming edit he’s working on. Filmed in the Bronx and Manhattan.“Rufio coming from the Bronx again threw all the horrible clips I had into a throw away edit just to keep everyone posted on how the edit is turning out peace keep rollin” -Stanley Hernandez. Check the p-rail edit of Stanley Hernandez from the Bronx, NY. Skating starts about 2 minutes into the edit. “This is Ruthio coming straight from the Bronx. Been recording like a mad man lately to try to put myself on the map in between recording for my edit I’ve decided to hit some small spots once in a while to keep you guys updated and let you know I’m still alive and going in. This is just a prail edit for now with my brother filming Luigi and a clip or two at 161 courthouse in the Bronx expect way more to come peace” – Stanley Hernandez. Check the recent edit at Allerton aka “A-Town” skatepark located in the Bronx, NY. The edit features kids who refuse to use their real names such as Hanibal, Skeeno, and Lil Shima. Filmed and edited by Hector Rodriguez. “A town is at it again with this dope edit all filmed in one day thanks you guys for coming out to film hope you like this edit peace” – Hector Rodriguez. Check the edit of Danny Irizarry from the Bronx, NY. Danny does a huge gap to start off the edit and continues to shread at Allerton skatepark in the Bronx, NY. Filmed and edited by Hector Rodriguez.